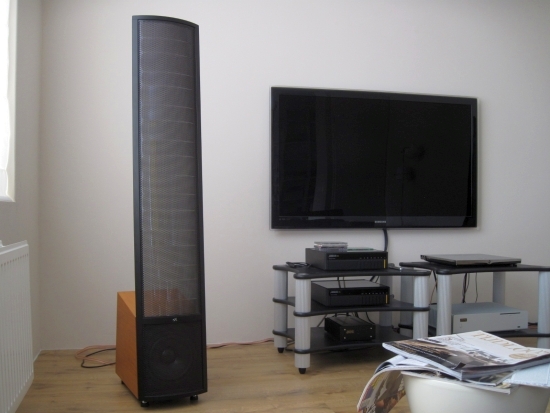 The Etos model has been around for a quite a few years already, but for me it still sort of qualifies as a “new” Martin Logan, in part because the last Logans I owned were SL3’s (more info here). 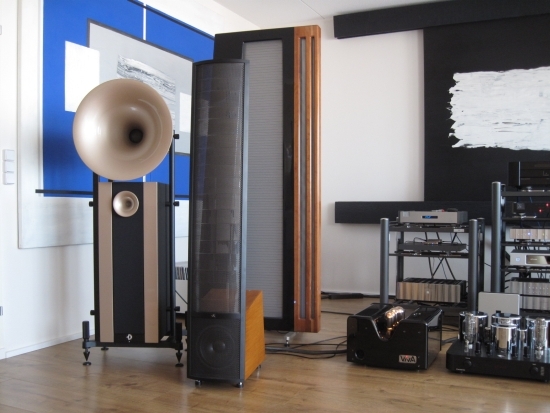 These oldies had splendid bass, incredible image focus and a midrange purity that other speakers at the time, the B&W Nautilus 804’s simply could not touch. The SL3’s treble however was noticeably dark and seemingly rolled off at the very end and in retrospect I think that they were in need of panel replacement. 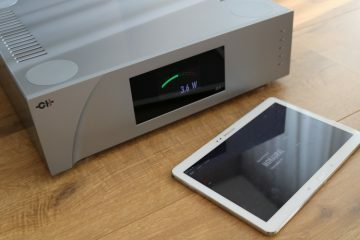 In terms of treble airiness it probably did not help that I used a Wadia 861 directly connected to Bryston 7B ST mono power amps either. 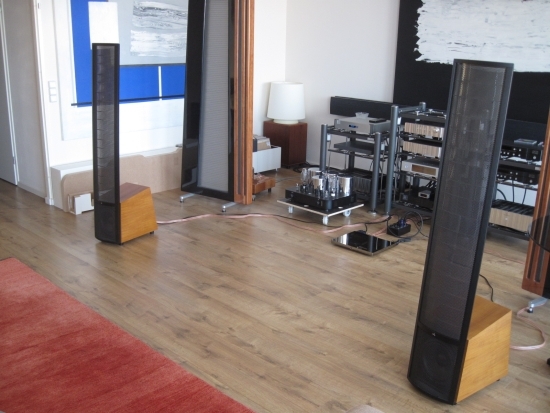 While the various Martin Logan models may look very similar on the surface, a lot has happened between SL3 and Ethos. I won’t list all the features here but what’s noteworthy is that the perforated stators now have bigger holes (and thus less metal to obstruct sound) and the foils use an improved process for applying the conductive layer that holds the static charge, which makes them quicker to charge up (about 2 seconds) and should also increase their lifespan. I first heard the Ethoses at Big Niels’ place. Previously these Logans were his main speakers, and he just could not let them go after obtaining Apogee Full Range magnetostatics. After having just heard the huge Full Ranges, we sort of plonked the Ethoses down, without worrying too much about their precise placement. Digital source and preamplification was from Spectral and the power amps for the Apogees’ HF/MF, and later for the Logans, were the Jadis JA200’s. 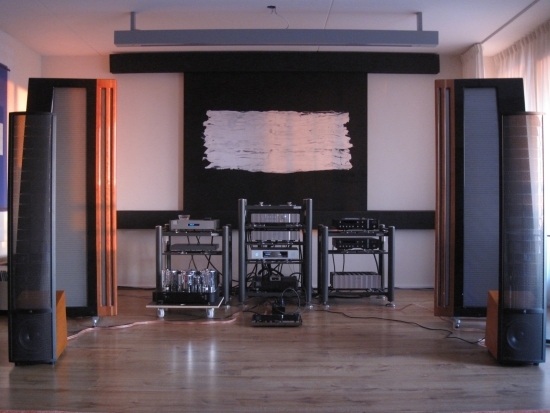 Big Niels’ listening room is very luxurious and immaculately built, but it is a little small for the big Apogees. The Logans, while timbrally not as natural, and bass-wise not as authoritative as the Apogees, were evidenly much better matched to the room dimensions: the soundstage was totally enveloping, with excellent focus, surprisingly deep bass and clean, fluid and super-airy treble on top. It was the latter aspect that really grabbed my attention at this time, because this was definitely not how I remembered the SL3’s to sound. 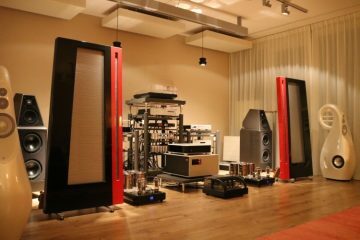 This experience made me want to own a pair of Ethoses too, even if like Niels, I already owned a pair of big Apogees, Divas in my case. 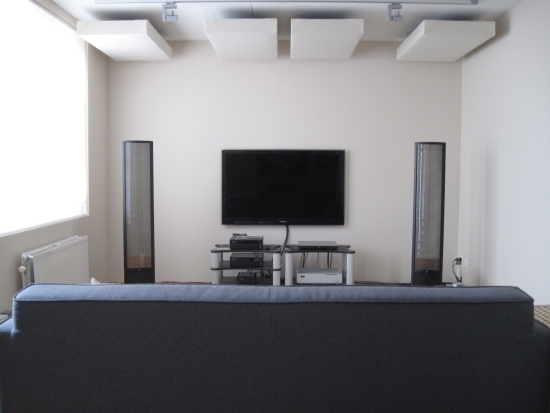 This necessitated me to transform two adjacent rooms separated by a hallway in my appartment by taking walls down and putting other walls into place, in order to create a larger secondary listening room. 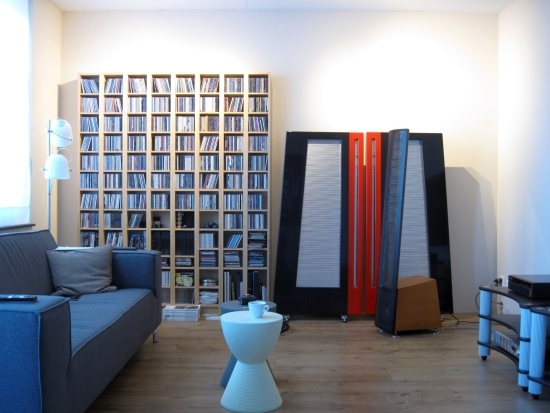 The Ethoses are hybrid electrostatic speakers with a dynamic bass section which is driven by an ICE power amp. This makes it possible to drive the speakers with relatively modest amplifiers. I am told that they work wonders with small class A / Single Ended Triode tube amplifiers, but I did not try this. Instead, I connected them to a Devialet 120 at first, and to the Jeff Rowland model 6 power amps later. 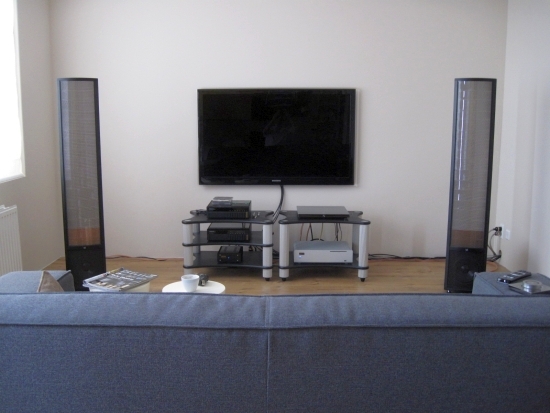 After finding a second hand pair at a good price we drove to Belgium and had a listening session the same evening. Again without placing them very precisely the Logans impressed with a room-filling soundstage and very explicit detailing. Fortunately in this setting too, the treble was nicely open and airy. The only problem I experienced was that the Ethos’ active bass units were at times exciting some nasty room modes, which admittedly sadly was inherent to the room I had devised. In an effort to curb the room modes, I tried various methods of bass damping such as double GiK 244 bass traps and I also tried home made bass traps. These cubes were highly effective, but in this setup I never got rid of the boom entirely. When I found the ideal positions for the Logans in their optimised positions along the long wall they produced an image focus and soundstage depth that my Apogee Divas in the main setup had trouble matching. Together with the Devialet the Ethoses also produced a level of detail and transparency that my main system also could not achieve at that time. Needless to say that I spent countless evenings in awe while being immersed in the Logan experience. 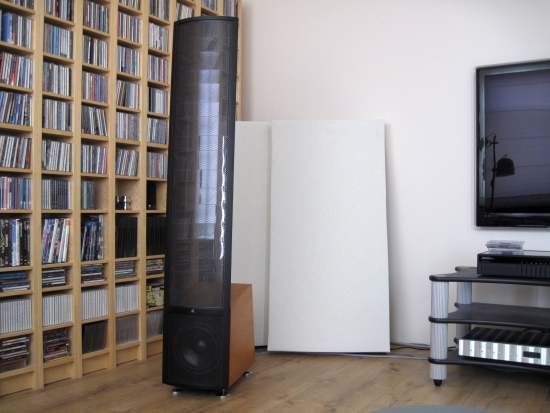 Apart from more easily exciting my existing room modes, the Ethos’ bass really was incredible: deep, powerful and sonorous, and when suitably tuned using the rear side volume level control, not at all dissected from the electrostatic foil. It is often said of hybrid electrostatics that the different nature of the dynamic bass section and electrostatic mid/treble treble section are audible, but even with my old SL3’s I did not feel that this was really the case. Sure, when having real full range dipoles at hand for comparison it is clear that there is no substitute for true ribbon/planar bass in terms of articulation and top-to bottom coherence. The Ethos’ bass has a different character than their MF/HF section, but in spite of this, I find that the Logans can really sound very coherent as well, as long as proper care has been taken in placing them very precisely and not having the bass volume set too high. Done properly, their bass is also fast and well-paced, and quite articulate. 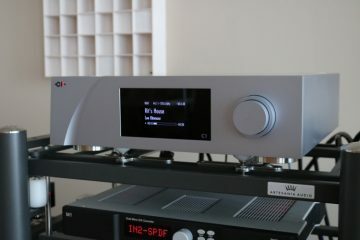 The Ethoses are about the same height as the Apogee Duetta Signatures, but infinitely less visually intrusive. Speaking of the SL3’s, the interesting thing to note is that the Ethoses do not sound in any way smaller, in spite of their more narrow radiating area. 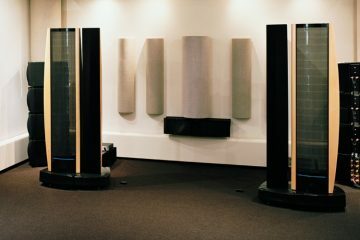 Although the SL3’s were taller, they did not tower out above me, and so even with these larger speakers treble would fall off significantly when walking around. 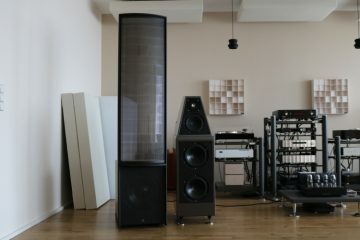 I do think that the SL3’s, having a closed cabinet with a single large passively driven bass driver can probably provide better bass in a difficult room. Then again the Ethoses’ active bass can easily be tweaked to have stronger or weaker bass at the touch or a rotary button, which can also be of great benefit. Contrary to popular belief, I think it is very easy to obtain impressive sound from a pair of Martin Logans. However it is the last bit of fine-tuning that takes a bit of time and patience. However this is then rewarded with the rare combination of a room-filling sound with excellent focus and soundstage layering. In an attempt to get rid of the room modes, I rotated the setup 90 degrees. 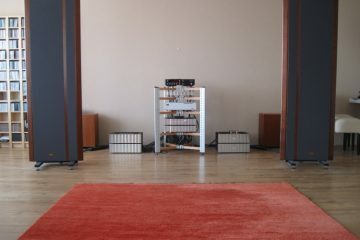 The speakers were now set up along the narrow wall and the listening position ended up being in the middle of the room. Interestingly, this setup reduced the overwhelming “headphone-like” enveloping soundstage but increased bass articulation and -precision, as well as image focus. Bass was less overwhelming and I found that I was slightly missing the former fulness, but can only conclude that it was now much more neutral. 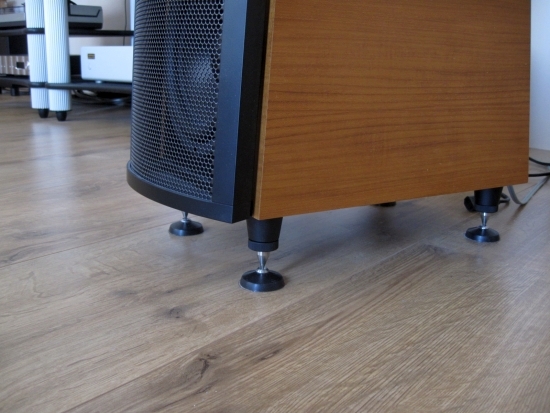 This speaker position greatly reduced the bass problems in the listening position, but retained them at the sides and in the rear of the room. Logans really are single-person speakers though, they sound fine for up to 3 persons sitting side by side but really only the middle person will hear the precise focus and soundstage layering that the Logans are capable of. Remember that I mentioned the initial listening session above where the Ethoses seemed to be very happy in a smaller room and provided better imaging than the big Apogee Full Range magnetostatics? The same seemed to be true to some extent in my own listening environment when I moved the Logans to my main listening room. With the Ethoses in the large listening room, connected to the Jeff Rowland amps, they still had great focus and definitely still had plenty of bass power to shake the room. But somehow they sounded less impressive than they did in the smaller room. In this big room, the feeling of being immersed in the sound was reduced significantly. Apparently they like to be in a slightly smaller room, or at least I found them to sound more impressive that way. 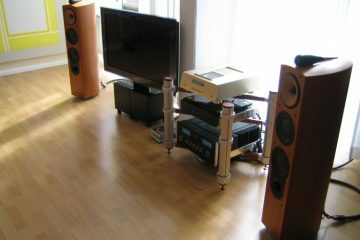 For some time I had a pair of AvantGarde Uno’s on visit. 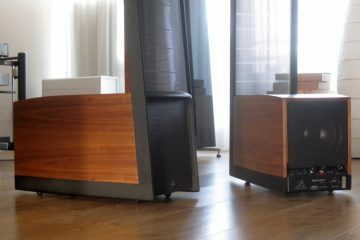 These speakers sound nothing like Martin Logans, but do share the way that they project sound forward and both speakers sound quite explicit. Ultimately though the AvantGardes provide the liveliest sound and have more visceral, more acoustically believable bass, while the Logans are more neutral and coherent in the midrange and are overall subtler and more refined. When I bought these Ethoses second hand, they were delivered without the metal pillars into which the ETC spikes are normally screwed. Instead, the spikes were screwed directly into the cabinet. I post-ordered the metal pillars which allowed for some nice comparisons. 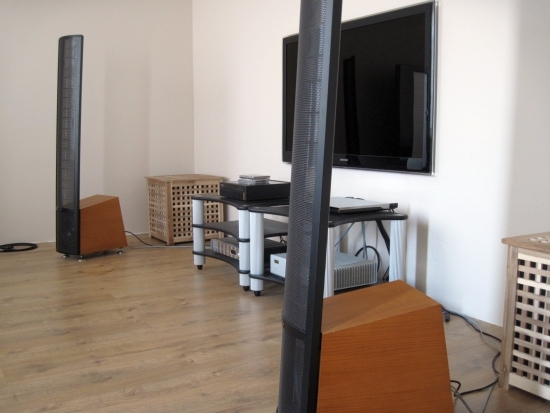 Most likely the previous owner wanted to limit the speakers’ height, but he may also have deliberately tuned them this way. 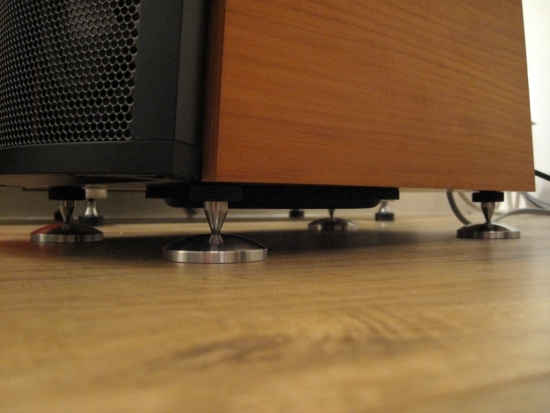 As I would later find out, the metal pillars make a very large difference in the way that the speakers sound. Without them they are very sweet and relaxed; with them they become much faster and much more articulate, and also more forward and cleaner. 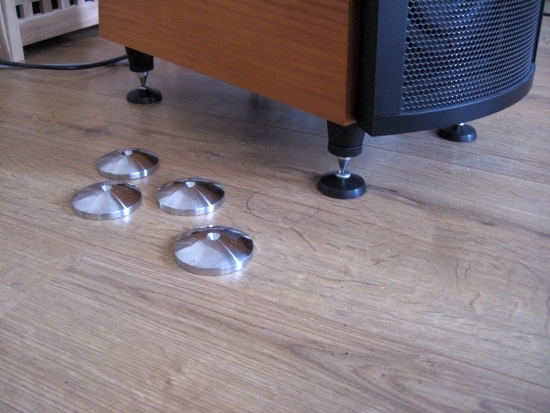 Please note that the spike bases also have quite a profound influence on the sound. As you would expect: the harder the material, the tighter and edgier the Ethoses sound. The black nylon bases are made by Artesania and sound very nice in the treble and midrange, but not as tight and articulate in the bass as the larger metal bases (also by Artesania). Although I have pointed out some problem areas, I want to stress that I do actually like the Ethoses a lot. I really do! But I think that the hefty bass cone movements necessitated by the very small bass cabinets can perhaps excite room modes more easily than larger, passive designs. That said the bass quality that they produce really is remarkable. Obviously with a line source treble is going to be beamy in the vertical plane. If you stand up, you lose most of the upper HF response. If you walk around the room a lot then this may not be ideal for you. If however you are always seated while listening then this is a non-issue. All Logans have a remarkable capability of throwing the sound forward. This makes possible for them to sound every bit as clear and detailed from 7 meters away as they do closer up. This also makes for fascinating listening, they simply never bore. For some tastes however, this excitement may be too much of a good thing. This forwardness can probably also translate into a glassy or harsh sound, if the matching components are inclined that way. 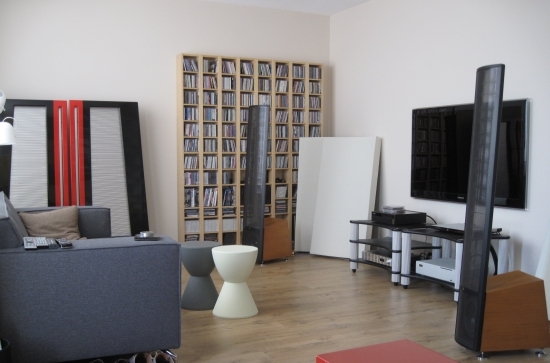 In my setup however, with either the Devialet or the Rowlands, at times they can sound very lively and forward indeed, but unless played very loudly with very brightly recorded material they do not normally step outside of my comfort zone. 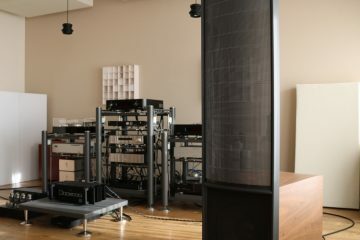 I have had a special spot for Martin Logans ever since the SL3’s and the Ethoses improve on these speakers significantly. 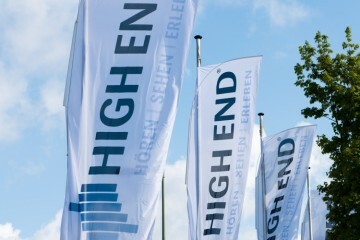 I feel that they provide a very high end sound at a not so high end price. In spite of my room mode-induced bass problems I think that they are actually not difficult to set up, and provide impressive results quite easily. 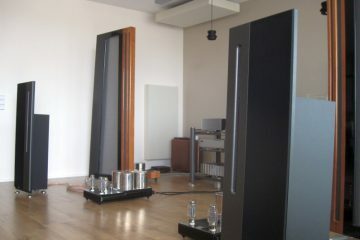 When you have taken the time to get the bass well-aligned with the electrostatic panel, these speakers play music with such a high level of coherence and such utter transparency that they might make it hard for you to return to normal dynamic speakers.